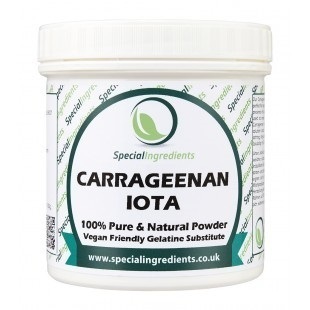 Premium quality Carrageenan Iota (250g). It can be used to make soft elastic gels which are frozen/thaw stable. It can make crystal clear gels and glazes, perfect for topping mousses, cakes and flans. Carrageenan Iota gels strengthen in the presence of calcium, making it perfect for use in milk and dairy based recipes, it can be used to make instant creme brules. Create milk and milk-based gels. A vegetarian alternative to gelatine. Carrageenan forms into a gel with potassium and calcium salts. Carrageenan must be heated above 60C until dissolved. The gel forms as the solution cools. Store in dark, dry and cool conditions. Main uses: Soft elastic gels, clear gels and glazes, milk based gels & glazes. Vegetarian,Vegan, Halal & Kosher friendly. This product is an additive - please only purchase if you understand its use in food flavouring, gelling, preserving or preparation etc. Do not consume in its concentrated form. Set up by food ingredients experts to focus on the growing demand from chefs for access to ingredients which until very recently had only been used by large food companies. From their factory in Derbyshire they now blend, prepare and produce a huge range of flavours and ingredients which you will now find in many of the top commercial kitchens around the world. In fact, if you saw the recent Bradley Cooper film 'Burnt', you will have noticed a lot of Special Ingredients products used in the kitchens! Special Ingredients works closely with Westminster Kingsway College where they sponsor the Culinary Science & Kitchen Innovation Laboratory. Feedback from students using their products is used to develop new and exciting blends and innovative products. I like nothing better than developing new products. Working with Dr Rachel Edwards-Stuart has given additional scientific support to innovate and create completely new ingredients that satisfy the increasingly technical demands of todays chefs. Food additive - do not consume in concentrated form. Store in a dry, cool place, away from direct sunlight in its original packaging. Ideally store in conditions between 5-20C. After opening: keeps for 6 months. 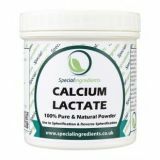 Carrageenan forms into a gel with potassium and calcium salts. To make the gel, pour the powder into the water/solution. Heat up to 70C until completely dissolved while constantly stirring. The gel forms as the solution cools. Ph Solubility: 4.5-10, Dosage Rates: 0.2%-2.0%, Ph Solubility: 4.5-10.